The drive back to Salt Lake City from Jensen took a bit longer than Google Maps said it would. This was at least partly due to the fact that I was so over the seats in that car. Once we arrived back in Salt Lake City, I had three goals: 1. to see the state capitol building (and, at one point, I could have crossed a moon tree off my list, but it is dead now); 2. to see City Creek, which was the water source for the early city (and still supplies water to the city today); and 3. to make it back to the airport in a timely manner. And I achieved all three. The trip to the capitol building took us up State Street (which makes sense), which eventually becomes one very lane going uphill. It was near the end of the work day (around 4:30 or so), so I figured that most traffic would be headed away from the capitol. I’m not sure why so many cars were headed towards the building at this time of day, but the road was very congested. This was not my favorite part of our trip, and made me wish we had had a little more time and energy on our first day in Salt Lake City to hike up the hill to the capitol. The view of the capitol building once you emerge from this narrow street is very impressive, I’ll give it that. Once you reach the capitol, you find a street, with the understandable name of “Capitol Street” that makes a circuit around the building. Due to the congestion we didn’t even attempt to make a left and instead just took a right turn. Along the eastern side of the capitol is a very small parking area, so we parked and I got out to take pictures. There was no time to go inside the building. It was so late at this point, that I despaired of being able to see City Creek until I looked at my phone and noticed that the creek went right past the spot where we were parked. The parking area is at the very edge of City Creek Canyon. So Alex stayed by the car and I took the winding path down into what turned out to be Memory Grove Gardens. At first, I have to admit that I thought that Memory Grove Gardens looked like a cemetery. I was unaware of the name of this plot of land at this point, but even the name sounds kind of cemetery-like. The path ended at a replica of the Liberty Bell. As I looked around a saw several marble monuments that looked more than vaguely like graves to my eyes. I spent quite a bit of my childhood visiting a great-aunt and great-uncle who lived down the street from a cemetery, so I’m no stranger to spending time in cemeteries. I thought it might be disrespectful to take pictures, though. Then I noticed some people walking dogs and decided that if it’s okay to walk dogs, it’s probably okay to take pictures there. I think I saw some kind of sign indicating that this was a park at this point. I’m trying to remember (it was two and a half months ago and the Google Maps car has apparently not been along Canyon Road down there yet). I think the sign indicated where the off-leash area for dogs stops. So I got some pictures of the park, the creek, and the walls of the canyon and went back up to the car. I had been down there for a while, and Alex was about to come down after me. We got back in the car and filled our gas tank at a very small gas station down the street from the Temple and then headed back to the airport. And even with the late start and everything we still got there in time to recharge our phones before we got on the plane (I also caught a Ponyta at the gate). I know that the traditional image of dinosaurs is as being an interest that children outgrow, but I have to admit that I’ve never outgrown my interest in dinosaurs. So when I was looking at routes between Salt Lake City and Yellowstone and saw Dinosaur National Monument on there, I knew that we had to visit it. In 1908 a group of paleontologists had found the femur of a Diplodocus near Vernal, Utah. Most of the bones had already been removed from that area, but farther on, they found a line of Apatosaurus tail bones. This area became the Carnegie Quarry. I cannot find any definitive answers regarding how many dinosaurs have been found there, but the tail bones they found were part of an entire Apatosaurus which is now on display in the Carnegie Museum in Pittsburgh. Alex and I arrived relatively early that morning, driving through the rain from our hotel in Vernal to the Jensen entrance to the park. We nosed around in the Visitor’s Center for a while and then took the tram up to the Quarry Exhibit Hall, which encloses what is left of the original Carnegie Quarry. And there’s really not much left of the quarry. There’s a diagram showing that the current Quarry Exhibit Hall area is about a quarter of the size of the original wall. If you take it in three dimensions, it’s an even smaller proportion than that. Alex and I spent quite some time looking at the bones in the wall. I took lots of pictures and asked two women working there what I should make sure to photograph. The one who answered me said that she liked an area that was mostly spines. There is also a spot where visitors can touch one of the bones in the wall. Of course Alex and I had to touch it, because why pass up an opportunity like that? About a thousand years ago, this area was also home to the Fremont, a Native American people. The Fremont left their mark on the region as well (though more intentionally than the dinosaurs did). Some of the rocks of the park have petroglyphs and pictographs. Petroglyphs are designs carved into the rock and pictographs are designs painted on to the rock. We had to hit the road if we wanted to spend any more time in Salt Lake City, so we only went to the closest section of petroglyphs, in what is known as the “Swelter Shelter.” I had seen pictures of the drawings of humans out by McKee Springs, but the road out there is dangerous when it’s raining, so we opted not to go out that far. Maybe someday, though. There wasn’t much that was destination-y about this leg of the trip, but it was beautiful. We also didn’t have a connection for the drive, which was frustrating. Even once we got back to where we did have a connection, my phone totally failed to see that we’d been following US 191 for most of the drive. We did have a connection in Jackson, Wyoming. I figured that there would be some place to eat and, upon arriving in Jackson, we passed an Albertson’s supermarket. We picked up some pop and a lemon loaf cake just in case we couldn’t find a restaurant. We did find a restaurant, though. We stopped at Liberty Burger, which is in the historic town center. I ended up doing a little white-knuckle driving in the historic town center — the roads seemed too narrow for the traffic to me — but the burgers were excellent. One of the times and places I can locate was in between Jackson and Bondurant, As we headed down US 191, I saw something white ahead. In Yellowstone, I got used to that kind of white being a thermal feature. As we drove closer, the white turned darker. Eventually it was nearly black and we turned the corner to see some burning trees up the mountain. We considered calling 911 but, I pointed out, we didn’t have a connection. We got closer and saw that there were emergency personnel nearby, so we wouldn’t have needed to to call 911 after all. As we continued to drive, we were passed by all sorts of emergency vehicles headed that way, and when we stopped so that I could get some rest miles and miles later, we saw a column of smoke from that direction. Later, once we got to our hotel in Utah, we looked up the area near where we saw the fire and discovered that there was a major fire near there that started at about that time, the Cliff Creek Fire. Later the Cliff Creek Fire became classed as a wildfire and it is still burning. They expect it to be fully contained around the end of October. I can’t promise that what we saw was the beginning of the Cliff Creek Fire, but either way, I can tell you that we were a few miles north of Bondurant, Wyoming sometime after (but not too long after) 2:30 p.m.
Wildlife Bridge, Wyoming, 2016 (photo by Alex Ogden). One of the other interesting things we saw was a bridge across the road. I had Alex grab my phone and take a picture of it. Later, I did some research and discovered that it was a wildlife crossing bridge, designed to let pronghorn antelope and mule deer cross the road safely. I have a time on that photo, but not a location. It doesn’t look like the bridge at Trapper’s Point near Pinedale, which comes to a point. I just spent too much time trying to figure out if this is the Trapper’s Point bridge or not. I finally looked at the bridge on Google Maps and it definitely looks different from this. We got lost in Rock Springs, Wyoming, which is a very pretty little town, as it turns out. I was kind of disappointed when Alex figured out where we went wrong. It might have been nice to explore a bit more. Finally, we returned to Utah. We stopped at Flaming Gorge so that I could rest my backside for a bit. The overlook was very nice, but it was getting later in the day, so the gorge was pretty badly backlit. We also spent some time at Flaming Gorge Dam. We stopped at the overlook, thinking that was all there was to it. Then the road took us actually over the dam, which was a nice surprise. We passed the Visitor’s Center and stopped again for a bit. I had hoped to make it to Dinosaur, Colorado that day, but with stopping in Jackson for lunch, stopping along the way to rest, making that wrong turn in Rock Springs, and our explorations at Flaming Gorge, it was nearly dark by the time we reached Vernal, which we had to go through to get to Dinosaur. So when we passed our hotel, we stopped for the night. Look it’s September 3 and we’re back. I probably shouldn’t be as surprised by that as I am, but it is nice when my schedule works out as planned. We got out a little earlier on our second day in Yellowstone, but not as much earlier as I would have liked. We actually bought breakfast in the hotel for once, so that used up some time, and then we went to the supermarket in West Yellowstone, which was *not* like the supermarkets back home. The produce section was very small and most of the store was prepackaged food. We generally like to get our pop from a supermarket rather than convenience stores, because we can get six bottles for the price of two or three from a convenience store. I’m never going to be able to retire on those savings, but it helps. The supermarket we visited didn’t even have six-packs of pop, just the same individual bottles you get at the convenience store. So that used up some time. Then we hit the traffic. 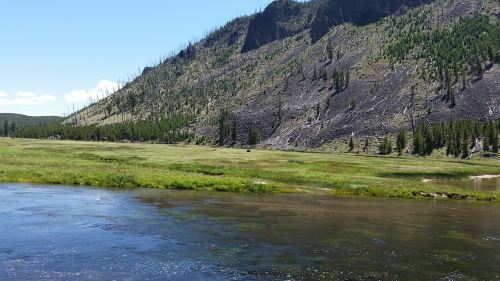 It was a Saturday, so Yellowstone was more crowded than it had been on Friday, but the biggest problem was road construction. It’s winter for quite a long time every year at that elevation, so tourist season is also construction season. And while we were there they were fixing the Grand Loop Road leading to Old Faithful. 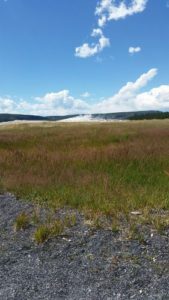 We wanted to get to Lake Yellowstone anyhow, so I suggested that we go around the long way, past the lake, and back to Old Faithful. We realized that would be at least a two-hour drive, so we opted to try our luck with Grand Loop Road. I have basically no sense of time, so I don’t actually remember how long we sat there; it certainly seemed to be longer than the half hour they expected it to be. Finally we made it to Old Faithful and, in contrast to the previous night, we had trouble finding a parking place. Our rental car was white, as were a lot of the other cars in the lot, which made it more fun to find the car in the lot on our way out. We got there so late that we wrapped around to being really early, so we ended up with time to kill. We bought some souvenirs and a couple of soft pretzels in the Old Faithful Lodge while we waited. Then when we went back outside the only benches available were way off to one side, so we sat on the boardwalk itself, which ended up being a nice place to sit, because it gave me a nice angle on the grasses in front of the geyser as they waved the breeze. A helicopter landed out behind the Old Faithful Inn while we waited for the eruption, and Alex loves vehicles of all types, so we went in search of the helicopter. It was a nice walk, and Myriad Creek, which runs behind the Inn, is very pretty, but we could have just followed the signs to the medical clinic, because that’s where we found the helicopter. After that we went into the Visitor’s Center because I promised myself that I would go into the backcountry at least once, but I’m also not an idiot. I know that people can get hurt or killed if they exceed their hiking abilities. So I asked the park ranger there what he would recommend for a “baby” hiker. He recommended a fairly easy path that would take us two hours to complete. We ended up walking 45 minutes or so, out and back. We did head into the woods briefly just to do it, but I put hiking mode on my phone so that we wouldn’t get lost; we were able to just follow the path that we’d walked out back (take that, Hansel and Gretel!). Back to Old Faithful, though. We considered having ice cream at the Old Faithful Inn before heading back out, but the lines were tremendously long and we figured that we could get ice cream at Lake Yellowstone (spoiler alert: we were never able to find it). So we headed out. We stopped at Isa Lake, which sits right on the Continental Divide and is notable for being the only known natural lake that drains into both the Atlantic and Pacific Oceans. Then we made it to Lake Yellowstone, which is not the easiest place to find parking, believe me. The parking lot for the hotel was full, as was the parking lot in front of the hotel, and there was exactly one spot available in the parking lot for Lake Lodge. Since we didn’t find ice cream there, we chose to go somewhere we were certain would have ice cream — the Canyon Village Deli, where we’d had sandwiches the previous day. So we headed back up towards Canyon Village and got ice cream. I tried the huckleberry flavor, which was pretty good, but after all of that driving, I needed chocolate. So Alex and I both got cups of Moose Tracks and mint chocolate chip. And, as with the previous day, the people there were great. We would have liked to have spent more time at Yellowstone, but I wanted to make an early night of it so that we could head out for Vernal Utah early the next morning. We didn’t make it out (of the park or of our hotel) as early as I would have liked. You see, on our way out, we finally had our first wildlife-induced traffic jam. We’d had gapers’ blocks from wildlife alongside the road (a black bear, a grizzly bear, a bull elk, etc. ), but on our way out, we actually ended up behind a bison. Alex attempted to take a picture, but the bison was near the center line on the road so he couldn’t get it for me. As luck would have it, the car in front of us came to a complete stop at one point, giving me a chance to stop completely and put my car in park long enough to snap a quick picture. It was nearly dark by the time we made it back to the hotel, so we went right to bed and, the next morning, headed for Vernal Utah. We’ll return for that drive on or around September 11. *I did some research later and by my calculations, you would need a 2700-car parking garage just outside each entrance, which would be about half the size of the parking garage at the San Antonio International Airport. You could drop San Antonio into Yellowstone and still have space around the city, so if you can drive past the airport parking garage and not notice it (which you can), it should be possible to build those five garages without too much disruption. Alex objected, saying that most people would probably want their cars. So I figure that you let the most motivated drivers bring their cars. Let a couple of hundred cars in at each entrance (for an extra fee) every day. This would reduce the size of the garage that you would need to maybe 2500 cars. Of course, RVs that are headed towards the campgrounds would always be allowed in, so long as they go pretty much right to their camping spot. I don’t know how long my discussion of Yellowstone will turn out to be, so I’ve tentatively labeled this as Part 1. Alex and I got kind of a late start on our first day at Yellowstone. The drive from Salt Lake City had taken a lot longer than we had expected. In addition to the two hours of scheduled stops, and the unscheduled more than an hour Rocket Display stop, I forgot my rescue inhaler, so we had to transfer it to a Walmart in Idaho and wait for it to become ready. I estimate that rather than taking four or five hours, it took eight or nine. At this point, I was not in a rush to get back in the car, even though I thought that I’d get plenty of time out of the car at Yellowstone. I didn’t get lots of time out of the car at Yellowstone. Let’s put it this way. San Antonio is the 67th largest city in the world in terms of land area. You could drop San Antonio on top of Yellowstone (not that I’d recommend this) and still have lots of space around the edges (19 miles all the way around, if my math is correct). So, yeah. Unless you book a bus tour, expect to spend lots of time in the car. Overall, I have to give Yellowstone a solid four out of five stars for producing megafauna to gawk at. Minutes after entering the park, we saw our first bison. By the time we left Yellowstone heading for Dinosaur National Monument, we saw even more bison (including several herd of bison in the distance, one ahead of us blocking traffic, and one alongside the road so close to our car we could hear it breathing — that was unnerving), a black bear (which was too close to the road, but we stopped and took a couple of pictures anyway, a grizzly bear (likewise), at least one yellow-bellied marmot, and at least one elk (or maybe one elk and two moose cows, or possibly two elk and one moose cow). I think I saw some pronghorn antelope in the distance once. We also heard something howling on two separate occasions (I’m not sure if they were coyotes or wolves). No dall sheep or actual sightings of wolves, and also it would have been nice to have gotten a picture of the things that I thought might be pronghorn. If I’d gotten those squares on my megafauna bingo card, Yellowstone would have rated five out of five. Believe it or not, that brown lump pretty much right in the center of the image is a bison. I also have some closer photos of it, but I wanted to share just the tiniest bit of the scale of the park as well. The water in the foreground is the Madison River. 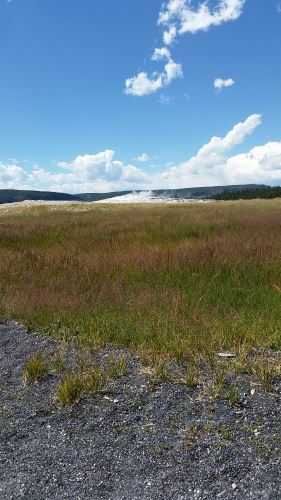 We chose not to go to Old Faithful first because Alex wanted to do some stargazing and I read several things that said that the area around Old Faithful is a good place to stargaze, largely because there are people there pretty much around the clock. Since it was just the two of us, I figured that keeping to populated areas after dark would be a good plan. As it turned out, 81% of the moon’s disk was visible that night, so the light pollution from the moon ended up causing us difficulty with the stargazing. I still owe Alex a stargazing trip. Back to that morning. We’d heard that there had been snow at the higher elevations in Yellowstone, so since we started out kind of hungry, we chose to eat at the Canyon Village, which is the highest in elevation (I hoped that perhaps Canyon Village would be close enough to the highest elevations that we could see if there actually was snow up there and maybe find a route up to it). We ended up eating sandwiches at the deli and while they were, you know, sandwiches, and not terribly exciting as cuisine goes, the people there were very pleasant and helpful. This set a very nice tone for the day. After we ate, we stumbled across the Grand Canyon of the Yellowstone, which is a place where the Yellowstone River cut into the rock and, well, created a canyon (just like it says on the tin). We found, and spent entirely too much time photographing, the Lower Falls. We saw a boardwalk that led down towards the river and, because I’m too adventurous for my own good sometimes, I convinced Alex to go down there with me. The trip down was great, but the trip back up was a bit strenuous. Just a year ago, he and I had climbed the Statue of Liberty with no problem, so I was sort of distressed about just how difficult I found the walk back up. However, the elevation of the Grand Canyon of the Yellowstone is around 6,000 feet, so perhaps that made at least some of the difference. After this, we went in search of even higher elevations, which led us up into the northwest corner of the park. I didn’t want to attempt to climb Mount Washburn. Oh, who am I kidding? I probably would have totally been up for it (despite the adventure I had coming back up at the Grand Canyon). Alex talked me out of it. Mount Washburn was probably our best shot at seeing snow on this trip, too. Oh, well, maybe it’ll snow in Dallas this year and we’ll luck out and be able to go up to Dallas to see it. While we were in that corner, we drove into Fort Yellowstone, where we saw an animal that I at first identified as a horse. Alex was taking pictures of it, and I asked him why he was taking pictures of “that horse.” He told me that it clearly was not a horse and later, when I looked at the pictures, I think it might have been a moose, though it was more of a yellow color than I was expecting. Looking at other pictures of moose and elk, maybe it was an elk. We parked and kind of knocked around a while at the Mammoth Hot Springs area (and I would like to go back and stay at the Mammoth Hot Springs Hotel some fall or winter) and took a lot of pictures of the thermal features there. At this point, it was getting pretty late and we were looking at an hour and a half drive, so we headed towards Old Faithful. We took even longer than that, because we found a whole area of thermal features that needed to be explored and photographed. Finally, with the sun beginning to sink in the west, we headed for Old Faithful. We got there just after an eruption, so we had an hour or so to kill, and during that time, the sun went down almost completely. I took some photographs of the geyser before the sun went down and then again afterwards (I also videoed the eruption, but my phone camera is not fantastic at night photography, so the video is mostly whooshing noises and blackness). We stuck our heads into the Old Faithful Inn (I had wanted to visit the Inn because I remember the 1988 wildfires that came *this* close to threatening the Inn). We then went to the Old Faithful Lodge and got a drink and two huge cookies to eat while we waited. One of the nice things about watching Old Faithful erupt after nightfall is that almost no one is there. We had fantastic seats. And the geyser gave us a nice several-minute show. After the eruption we looked at the stars for a bit, but I wasn’t sure if they really would let us out of the park that late at night, and we still faced a 45-minute drive (during daylight hours — we were driving just a little more slowly because I didn’t want to end up wrapping the car around a moose or something) back to West Yellowstone, so we headed back out. We stopped along the way and looked at the stars again on the way, as well. And, since we’re at over 1,000 words, this looks like a good place to stop for now. So I will end up with at least two posts on Yellowstone. We’ll meet here in Montana/Wyoming again on September 3, I think? I have to admit that I keep forgetting what year it is. I work as a pharmacy technician and, as such, I have to keep an eye on expiration dates for the medications and if they expire in less than a year I have to change the expiration date on the label to match. Somehow, this ends up with me thinking that it’s a year ahead of when it really is. As a result, I may end up labeling some of these as being in 2017. Anyway, back to the subject at hand. Alex has always loved vehicles. He now is into spacecraft and airplanes, but trains, cars, trucks, he’s really fond of them all. So when I was planning this trip and someone told me that the site where they drove in the golden spike that completed the transcontinental railroad was just north of Salt Lake City, I had to add it to our itinerary, even though it would slow us down by at least an hour. The original drive from Salt Lake City to Yellowstone was only about four and half hours, so what’s an additional hour between friends, right? Well, first we made the stop at Great Salt Lake State Park, so that added another hour to the trip, so instead of the five and a half hours I was expecting, we ended up at six and a half hours. But I live in Texas, so spending six hours or so behind the wheel of a car in one day is nothing new. Although, admittedly, those six hours are usually a round trip and not just the outward trip. So now we’re looking at a six and a half hour trip. But then as we’re heading out on route 83 on our way to Golden Spike, we pass a sign that says, “Rocket Display.” Alex wants to see it, and my first instinct is that it’s going to turn out to be some old man with random parts in a barn or something, but I agree to go, so long as it’s not too scary when we get there. Turns out that “Rocket Display” is a rocket garden in front of the offices of Orbital ATK. Many of them were more missiles than rockets (and I tend toward the pacifist, so I was not terribly enthusiastic about that aspect of it), but Alex loved it and took at least one picture of everything in the garden. They did have the rocket booster from a space shuttle, which is really a challenge to photograph well, I’ll tell you. After an hour (maybe longer), Alex and I were back on the road to Golden Spike National Historic Site. We got there around 3:00 p.m. and, if I’d been willing to hang around in the heat (or in the gift shop) for a full hour, we could have seen them put one of the replica engines in the shed. I kind of wish I’d gone to Golden Spike when things were slightly less, you know, hot so that we could have seen the engines move back into their shed. Despite what I was told about the desert feeling less hot because it’s a “dry heat,” it still felt like we were standing under a heat lamp out there to me. Most schoolkids learn the story about the transcontinental railroad in school in the United States. The Union Pacific Railroad started construction from the Mississippi River heading west and the Central Pacific Railroad started construction from Sacramento heading east. When they met at Promontory, the heads of the two railroads held a big ceremony when a literal golden spike was driven into the track and into a tie made from laurel wood. Immediately after the spike was driven, by the way, they pulled both the spike and the tie out and replaced them with an ordinary spike and tie. The original golden spike is on display at Stanford University. There were a number of things that were on display at the site that were interesting. Apparently when they changed from iron to steel rails, they changed the shape of the rail. There is a piece of what they claimed was the original rail from that section of the track on display there, despite most of the track having been sent to be recycled for the war effort during World War II. There is also a monument to the Chinese workers who built the railroad. And there are a number of historic photographs. I love historic photographs. Most of the site seemed like it ought to be accessible to wheelchair users. There is a part of the site that is on the other side of the tracks, and there is a kind of ramp over the tracks. The other side is unpaved, however, and aside from a few interpretive signs, the only thing on that side is two wooden staircases that take one up to look inside the replica engines. I don’t recall them having any kind of ramp, however, so that part is probably not accessible. I try to visit all of the famous bodies of water that I can make it to when I travel. In 2014, Alex and I went way out of our way to see (and for me to dabble my feet in) the Mediterranean. So, I had to at least see the Great Salt Lake. I had two choices of destinations to visit the lake, Great Salt Lake State Park and Antelope Island. Antelope Island looked as though it was more “on our way” than Great Salt Lake State Park, since it’s northwest of the city and we’d be traveling northward on our way to Yellowstone, but when I put them both into Google Maps, I realized that Great Salt Lake State Park was actually significantly closer, because to get to Antelope Island, you actually have to go north and then back south again. So, since we were facing a seven-hour trip (six hours if we were going direct, but we were planning to stop in Promontory to visit the Golden Spike National Monument), we opted for the easier-to-access destination. The Great Salt Lake, 2016. The water was particularly low this year. So we headed out. After a brief stop at the store for provisions, we hit Interstate 80 towards Magna. 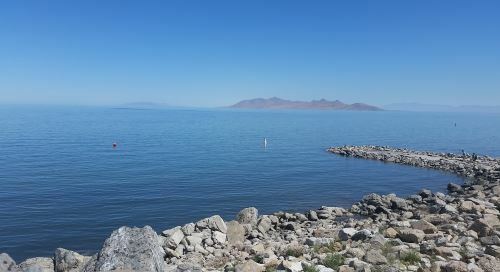 It turned out that Great Salt Lake State Park was probably the better choice for two reasons aside from the shorter commute time. 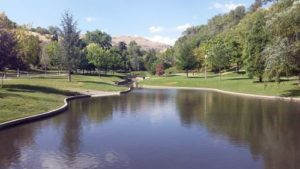 First, I had read about Saltair, a Victorian-era resort where Mormon dating couples could go swimming and dancing without worrying about their reputations because there were Mormon chaperones everywhere. I did not realize that Saltair had been in that section of the lake. I say “had been” because the original Saltair was destroyed by a fire in 1925. The building at the exit from Interstate 80 is not exactly where the original Saltair had been; the original was two miles farther east, but it was close enough in my opinion. The second was the Kennecott Utah Copper smelting plant, which is pretty much directly across the Interstate from the park. I had noticed the smokestack (the tallest man-made structure in Utah) from the air, and if we had gone to Antelope Island I may never have known what that smokestack belonged to). We nosed around in the visitor’s center for a while and then headed outside. The lake was, well, a lake. There is a lovely little island not too far from shore, and there were a *lot* of brine flies on the shore. There are only two things that live near that water — brine shrimp in the water and brine flies near the shore. However, the brine flies attract (1) migratory birds and (2) spiders. I like spiders, so that part was cool for me. I didn’t swim in the water (I still had a six-hour (it ended up being even longer) drive ahead of me), but I did wade in up to my ankles. The waves made nice Zen-garden-feeling patterns in the sand. I rinsed my feet off under the hose, but still felt like I needed to wash my hands. The restrooms were kind of dark, but seemed clean enough when I was there. The observation deck is fully ADA-compliant, as are the restrooms, or so the website of the architect who designed them assures me. Unfortunately I couldn’t find a path down to the water that wasn’t rocky, so that seemed off-limits to wheelchair users. I applied for a couple of jobs on a whim and actually ended up with one job interview. I won’t know how I did until sometime next week, but it’s been hard to focus on pretty much anything besides that interview (particularly since I went out and bought a whole new outfit — shoes and everything — for it) in the last few days. And I may have done the first. The record I found was for the correct date and the surname starts with the correct three letters. Unfortunately, as helpful as the people at the Family History Library were, no one there that day spoke Russian. I did the 7th as a technicality. The park ranger directed us to a path that was fairly well traveled (and thus not terribly likely to end up with us disappearing without a trace or anything) and, as it turned out, 212 yards of it were unpaved. As a result, for 12 yards in the middle of the path, we were technically 100 yards from a paved road. We also made a sharp left into the woods and walked for a total of about a hundred yards, but we had to turn right to get around an obstacle, so we ended up less than 100 yards from the path. And we got four of our five states in. We never made it to Colorado, since it was really late when we got to our hotel in Vernal and I just didn’t have the energy to drive any longer that night, even if Colorado was only a half hour away. And the next day, we got a later start than I would have liked, so we had to head back to Salt Lake City and didn’t get to go to Colorado that day. But I still got to visit Utah, Idaho, Montana, and Wyoming, so four out of five isn’t bad. Alex and I leave for Chicago early Monday morning, so I’m going to type up my next National Geographic post tonight or tomorrow and perhaps write up Golden Spike National Monument as well. Those will be my posts for August 8 and 10, and by the 12th we’ll be home. I mentioned back before the trip that I hoped to find the birth record of an ancestor while I was in Salt Lake City. I figured it wouldn’t take that long, but it ended up taking about three hours. Alex is very patient. I may have found the record (we do know that the birth date and the first three letters of the surname match what I know about the ancestor), but it’s in Russian and I don’t speak Russian. Afterwards, we spent a few hours in Temple Square, which seems much larger than I think it actually is. Officially, Temple Square is ten acres, which is three times the size of Main Plaza here in San Antonio. 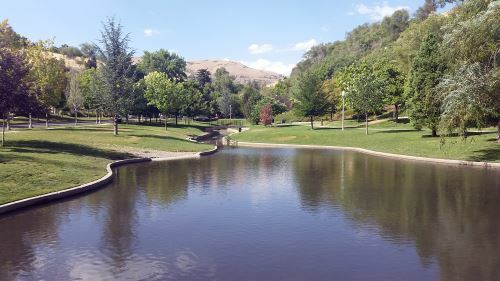 However, just outside what I think is the official Temple Square is a reflecting pool and then there is another probably ten-acre parcel with other buildings on it. At any rate, the other parcel looks to be the same size as Temple Square. Since we came in from the Family History Library, we, of course, approached through the Temple Street entrance, in between the Assembly Hall and the Tabernacle. There are so many trees in Temple Square now that the impact of the Tabernacle is somehow lost. I was very taken by the Assembly Hall, though, and took lots of pictures. 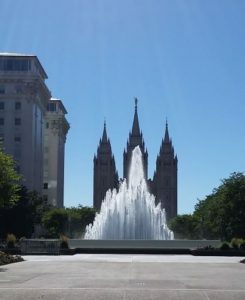 We walked around the fence around the Temple (not being Mormon, we didn’t have, erm, a prayer of getting beyond that fence) and discovered a reflecting pool and, beyond that, office buildings for the church, the Joseph Smith Memorial building (which used to be the Hotel Utah) and a fountain (see image). Even farther on, you find the two homes of Brigham Young, the Lion House and the earlier Beehive House, both named for sculptures that are part of their architecture. The Lion and Beehive Houses were designed by the same architect who designed the temple itself. The temple points “towards Jerusalem,” which means east. I once looked up the shortest possible distance from my home to Mecca and found that I would have to face northeast (more or less), so I suspected that was true of the temple and Jerusalem, as well. And it is. The temple should, technically, face northeast. But that’s not the actually odd part. No, the odd part, to me, at least, is that the temple is on the eastern edge of the square, so that when you approach the temple from the square itself, you are walking up to the back of the building. I wonder how many non-Mormon businesspeople and tourists staying at the Hotel Utah looked out of their hotel room window and had similar thoughts. I’m something of a science buff. I’m no expert on anything, really, but I like to read articles on science topics. I’m not sure when I first heard of Pando. It’s a quaking aspen colony in the Fishlake National Forest and it’s the most massive single organism in the world (that we know of at this point, at least). Not the largest in area — that’s a fungus in eastern Oregon — but the, one source I read says, “heaviest,” which is I guess accurate in Earth’s gravity. Mass, though, isn’t just weight. It’s the amount of “stuff” that compose the object. Pando has one root system and thousands of stems. 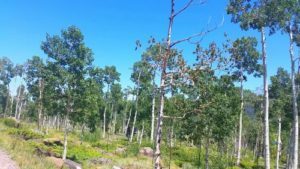 The scientists suspected that Pando was one big tree and once they could examine its DNA, they saw that every cell of every stem for over a hundred acres had the exact same DNA. And not like all Cavendish banana plants have the same DNA (though they do). From what I can tell, the epigenetics, the changes in the expression of the genes, are the same, as well. And that would basically not happen from cloned plants. On the slightly less uplifting front, Pando may be dying. It’s had a good run; scientists estimate that it’s 80,000 years old at a minimum, but people would like to help extend its life. They’ve fenced off portions and are experimenting on them to see what it would take to keep the tree alive. So I guess I’m glad I got to see it when I did. While we were down there, we decided to check out Fish Lake itself. And Fish Lake was amazing. It was the bluest lake that I think I’ve ever seen. I joked with Alex that they put Ty-D-Bol in the lake. Unfortunately, Alex is too young to remember Ty-D-Bol so the joke was lost on him. So we drove around the lake for a while, marveling at the blue color (which is, of course, totally natural, the blue color is something to do with limestone in the water) and taking pictures. Then I girded my loins for the trip back to Salt Lake City. Why did I have to gird my loins? Well, we drove down from Salt Lake City immediately after landing and getting our bags and rental car. This trip is how I discovered that the seat of the car was incompatible with my seat. As a result, drives that Google Maps said would take seven hours tended to take nine or more. I ended up having to stop every hour and a half to two hours to rest my rear end.